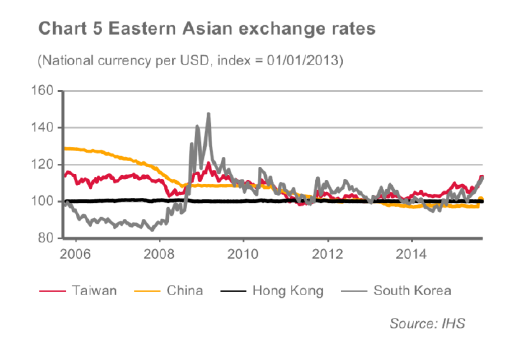 The impact of the Chinese stock market crunch of this summer and the renminbi devaluation should not be overestimated. As government stimulus will be stepped up to keep growth at 7%, the risk of a hard landing has increased. But it is not our main scenario. It is the slowdown in the Chinese economy that matters; which is specifically felt by Asian commodity exporters such as Indonesia, Malaysia and Thailand. As was clearly visible over the past weeks, concerns about the downside risks to the Chinese economic outlook are creating uncertainties and volatility in the markets. Since mid-June the Shanghai stock market has dropped by approximately 40%, the largest decline in the past two decades. The Chinese authorities have intervened to stop the decline, but most of the damage was already done. The turmoil is now quieting – at least the stock market fall has more or less come to a halt. Global stock markets, initially following the Chinese shares in late August, are already recovering. Moreover, when assessing the developments in the Chinese stock market we should keep in mind that through the six months prior to the downturn, the stock market increased sharply. Apart from that, the impact of the crash on the real economy is small. Unlike in the Western countries, the stock exchange is small compared to the size of the economy. Chinese consumers do not depend on shares for their wealth either. Only one-fifth of China’s household wealth is invested in shares. It was not only the stock exchange that collapsed over the summer. The renminbi was devalued as well, by 1.9% against the US dollar. Similar to the stock exchange, the impact the devaluation should not be overestimated. The devaluation was interpreted by the markets as an action to support China’s exports, and thus economic growth. However, as the official Chinese stance indicated, it could, and should, also be seen as a move to show that it will accept a more market-based exchange rate. The IMF is soon expected to make a decision as to whether the renminbi will be included in the Special Drawing Rights (SDR) basket. For China, this would be a milestone in its efforts to be recognised as a global financial power. 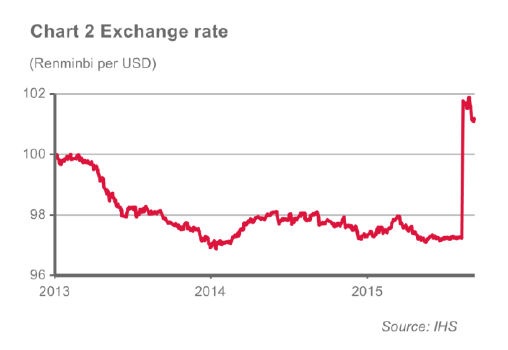 China simply has to show that it is serious about liberalising its exchange rate. Besides, the renminbi is widely seen as overvalued (by approximately 20%) and the devaluation was so modest in this context that it could not be considered really supportive in making Chinese products cheaper. 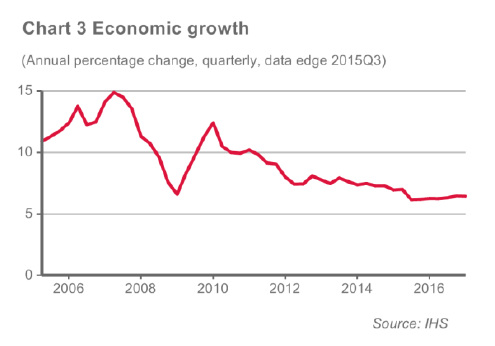 Economic data from China are indeed signalling weaker economic growth. Growth in investments and industrial production decelerated in July this year and exports fell, by 8.3% year-on-year in July. However, it is not all bad news from China. Consumption and labour market indicators have remained robust. Nevertheless, weaker data, and arguably the stock market turmoil, have prompted the central bank to lower the interest rate as well as the reserve requirements for banks. Monetary easing has been relatively modest until now. To sustain economic growth close to the official target level of 7%, more is needed; and that can be done. The one-year benchmark lending rate is 4.6% and the required reserve ratio for large banks is high at 18%. On the fiscal side the government has ammunition to increase spending as well: July readings of the fiscal balance indicated a surplus. Although the government can (and will) support the economy this will aggravate the underlying vulnerabilities of the economy. Lower interest rates fuel the further extension of credit and debt. Rapid credit growth has resulted in a very high debt-to-GDP ratio of over 280%. Significant debt has been taken on especially by local governments and state-owned companies. Additionally, the property sector, which has been the engine of growth since 2008, alongside real estate and related industries (construction), are highly leveraged. With more lending to come, default risks are elevated. The government is aware of this and has a reform agenda to address these weaknesses. In addition, rebalancing the economy to a more consumption-oriented one is a government priority; investment still accounts for over 40% of GDP. That rebalancing is a slow process but will help to avoid a hard landing (of 5% growth or lower). Still, the risks of a hard landing have increased, as more weak data come in and the government steps up its efforts to keep the economy at the planned growth rate of 7% this year. The more government support, the higher the risk of a hard landing. Stock market crunch or not, the Chinese economy is inevitably slowing down. There are regional and global spill-overs, through trade and commodity prices, which had already become manifest before share prices plummeted. Property and investment booms have been key drivers for the demand for commodities, especially metals and ores, over the past couple of years. That clearly has affected commodity-exporting countries, making them the main victims of the slowdown. Not only metal-exporting countries, but also oil-exporting countries are being hit. This is particularly visible in the blows to some countries’ currencies as a result of the Chinese renminbi devaluation, particularly in Indonesia and Malaysia. The picture could get bleaker now that the Federal Reserve (Fed) is moving in the direction of a long-expected interest rate increase. Still, as long as that process remains properly managed Atradius Economic Research and communicated by the Fed, casualties should be avoided. A repeat of the Asian crisis of the late 1990s is not in the cards. 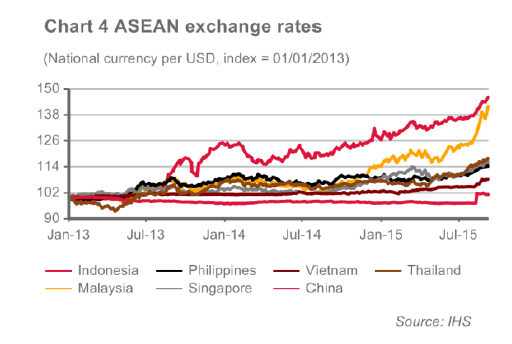 As commodity exporters were under pressure, currencies of northeast Asian countries were hit as well. But for a different reason. These countries are highly integrated with the Chinese economy and trade much higher value-added products, also in competition with China. The depreciation of their currencies is thus to be interpreted as a necessity to be able to stay competitive and not so much as a sign of weakness. 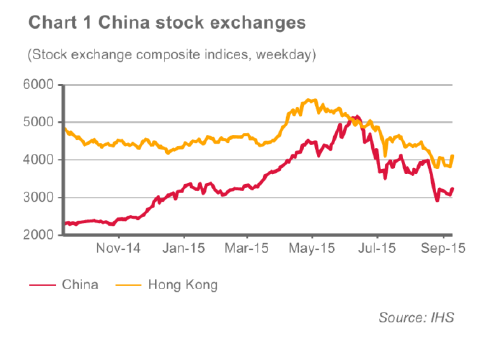 In short, the impact of the Chinese stock market crunch should not be overestimated. It seems very much a local issue, global markets now seem to realize that. The devaluation of the renminbi, perhaps considered ill-timed by the authorities, was very modest and will have a very limited impact as well. One can better consider the longer term trends in the Chinese economy and its impact on the regional economy, especially for commodity exporting countries. Moreover, the upcoming Fed rate rise is to be watched carefully. Finally, the events of this summer have highlighted the vulnerabilities of the Chinese economy, the slow rebalancing and risks of further government intervention.